GIFs are an interesting part of our how we’ve come to express ourselves. What’s even better is that GIFs have increasingly crept into everything from our text messages to Twitter and Facebook statuses, Instagram stories, and even professional websites. Over the last few years, these fun, soundless, and short animated bits have had no issues transcending screens and situations—making them the ideal addition to almost any communication. For what it’s worth, the majority of folks seem to be on board with their rapid and diverse adoption, which explains why GIFs are now starting to show up in a new context: email. Not surprising at all, right? We agree. But, if you have yet to send or receive an email with a GIF in it, you’re probably wondering how they can be used without the sender coming off as giddy or unprofessional. We considered this as well and came up with what we feel are five creative ways to get away with adding GIFs to your emails. Hopefully, something on this list will resonate with you, so you don’t have to miss out on the fun of spicing up your future emails with a GIF or two. 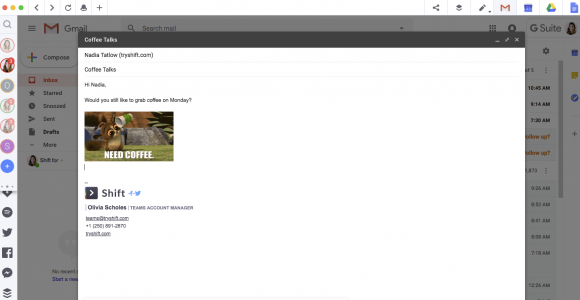 On the surface, the thought of using a GIF in an email seems harmless—as it should. But, in this case, the concern isn’t so much with if GIFs should be used in emails as it is with how to use them when you email someone. First thing first, whether you’re a GIF connoisseur or haven’t the slightest idea about how to get your hands on one, we recommend using GIPHY—the largest GIF library on the web—for all your GIF needs. OK, now on to the good stuff. Did you know that there are word GIFs? The great thing about these types of GIFs is that they add a safe amount of personality to your conversation and eliminate any worries about being misinterpreted or poorly delivering your message. Adding one of these simple GIFs to the introduction of your emails is an excellent way to ease you into using GIFs in your email communication. We all know how easy it is to fall into the habit of skimming over an email and only focusing on what we think is the most important info. Well, if you do this, chances are your recipient does as well. In this case, using a GIF (or two) to direct the recipient’s attention to the most important content within the email can help increase the chances of effectively getting your message across—the first time around. We’ve used this approach in the past and can attest to its effectiveness. For instance, we sent out a team email that contained a lot of updates and reminders, and we used this GIF (below) to make sure the important content wasn’t overlooked or underappreciated. Admittedly, it can be difficult to gain buy-in via email. Shoot, sometimes it’s hard to get buy-in when you’re face-to-face, so email is a whole other ballgame. In any case, when it comes time to build a foundation of trust upon which to present new ideas to your team or client, a GIF may be an appropriate (and necessary) way to ease the fear. Whether you need to encourage buy-in from employees for a new team collaboration tool or motivate client buy-in for a new advertising strategy, a funny or relatable GIF can do well to get your recipient on board. If you’ve ever felt like your message would be that much more effective if you could somehow show your recipient what you mean, then you’ll appreciate this one. There are millions of GIFs floating (and flashing…and looping) around that can be the cherry on top of your nearly-perfect email. All you have to do is find the right one, plug it into your email, and boom, your message is concrete, and your recipient won’t need any additional clarification or explanation. OK, so not every GIF you’ll use (or need) will already exist. In this case, you will have to resort to making a GIF that highlights and markets a particular service or process that you’re interested in offering your email recipient. Not only is seeing believing, but your recipient is sure to appreciate the opportunity to experience your product/service or process in the comfort of their email. If you’re wondering about how to make a custom GIF, there are hundreds of GIF-making sites and thousands of GIF-making tutorials online. Not to mention, GIPHY offers its users an easy-to-use GIF maker. We consider each of these tips to be a safe bet regardless of who’s on the other end of your email: friend, boss, client, coworker, etc. So, the next time you’re going for gold in your email to a client or coworker, revisit these tips, plan, and craft your emails in Shift, go pick out an awesome GIF, and let your personality shine.